Paramount Home Entertainment released the Australian hit 'Tomorrow When The War Began' (click away to check out Paul's review) this week and they're being ever so kind by letting us give away three Blu-rays for FG readers. Find out how to enter below. 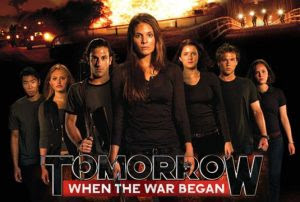 'Tomorrow When The War Began' is the film adaptation of James Marsden's hugely popular novel series and stars Rachel Hurd Wood ('Perfume: The Story Of A Murderer') and Caitlin Stasey ('Neighbours'). The film follows a group of teenagers who unexpectedly find themselves in the midst of a war, after going away on holiday. They decide attack is the best form of defence as they then take on the hostile invading force. HOW TO ENTER: For your chance at winning one of the three Blu-rays on offer, you'll first have to make your way over to our facebook.com/fadedglamour and "like" our page. Search the page (ctrl+F, if you need to) for the post beginning "TOMORROW WHEN THE WAR BEGAN BLU-RAY COMPETITION..." and simply comment on that post with your answer to the question: "Tomorrow Never Dies or The Day After Tomorrow?" 'Tomorrow When The War Began' is available to purchase at amazon.co.uk.